It’s indeed not easy to get a seat at Sawada. 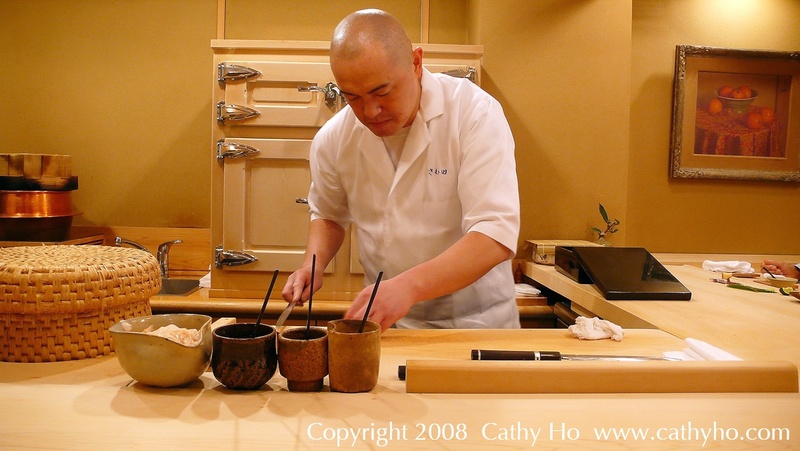 Think about this – 7 seats only, Michelin 2 stars, one of the hippest Sushi places in Tokyo. I was lucky enough to get in there and be seated right in front of the chef Sawada Koji (澤田幸治). Sawada is 38 years old, the same age as RyuGin’s chef Yamamoto. He used to work for one of the top Sushi places in Ginza – 青木 (Aoki). Some Japanese media even claim that Sawada is the most difficult sushi place to get a seat which really tempted me to go there. I arrived at 13h50, 10 minutes earlier than my reservation scheduled at 14h. There were another 2 guests who had just arrived. There are only 2 people working at Sawada – the Chef himself and his helper. Sawada speaks a little English. He asked me if there is anything I don’t eat. I told him I even ate ball fish, then he laughed. 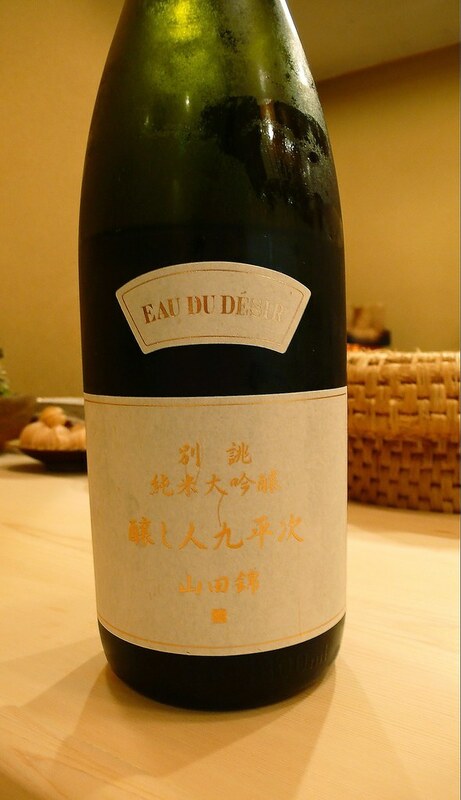 Before starting the meal, his helper brought this sake – “醸し人九平次 別誂（べつあつらえ）純米大吟醸 Eau du desir” to me. It’s my first time to taste this sake, and it’s an unusual one. Why?! It’s the first sake being introduced to a few Michelin 3 star restaurants in Paris, i.e. Pierre Gagnaire and Guy Savoy. This sake is really good and I would not hesitate to say it’s the best one I had so far in this year. 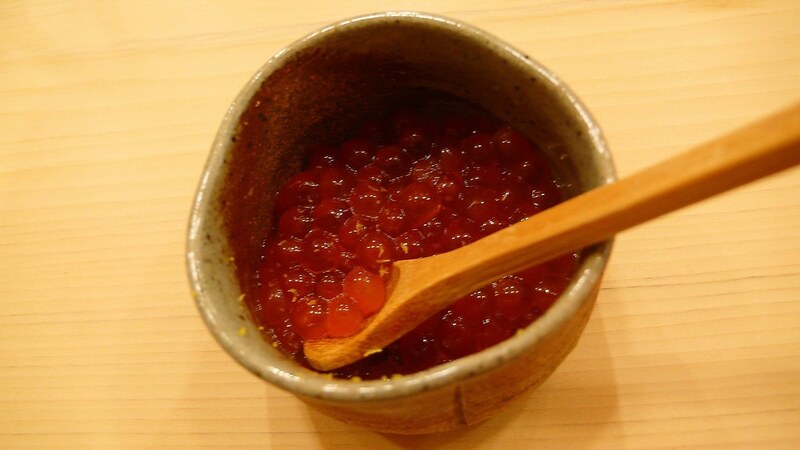 The first appetizer Sawada brought to me is I-Ku-Ra, the loose salmon eggs with a bit citrus sauce which offers a very light and elegant touch to the salmon eggs. The quality of salmon eggs is impeccable. They just easily melted in my mouth. Afterwards, the Sawada style sushi feast started. I totally enjoyed looking at how he worked with his knife and shaped the sushi with skillful hands. He’s like an artist! Every sushi is just incredibly great and delicious. Sawada only uses the best fish he can get on the day (he has very limited sleeping time ‘cz he has to choose fish by himself every early morning). This sushi place totally blew me away. Even now, I could still remember how those fish tasted in my mouth… How that great O-toro brought the heavenly pleasure to me… The wild sea eel, the different unis (sea urchin) from Hokkaido and Kyushu, …everything is just incredible. Even the simplest atsuyaki tamago (egg cake) demonstrates what perfection would be. Although our communication wasn’t much, by his genuine smile and extremely serious attitude to his sushi, I can tell that he really cares about his guests. Sawada, a man gives sushi with a spirit…! P.S. 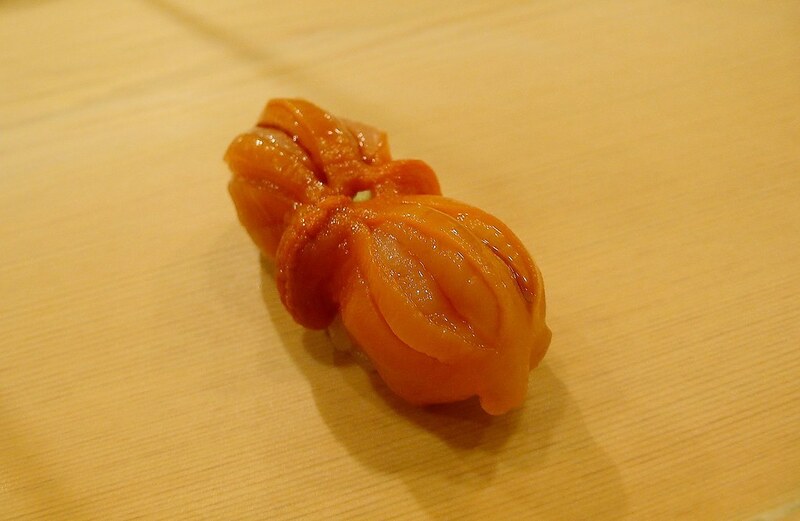 The 3 star sushi places are Mizutani (鮨 水谷) and Sukiyabashi Jiro (鮨 すきやばし次郎). At beginning, my first choice was Mizutani and 2nd choice was Sawada. I didn’t put Jiro as my first choice after doing reserach on several Japanese websites. The ratings of Mizutani or Sawada are the highest. Michelin Guide is worth it as a reference to, but when it comes to the end, I would rather trust a local insider’s taste. 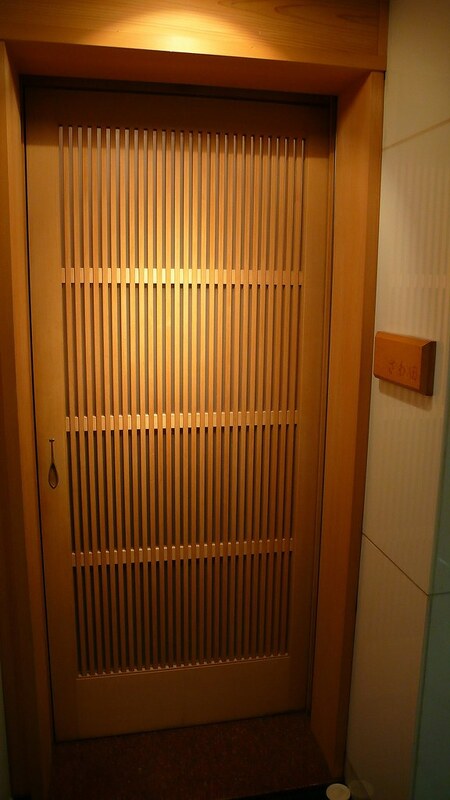 Sawada is hidden on a small alley in the most expensive area Ginza in Tokyo. I think I preferred this Kyushu uni to Bafun uni. 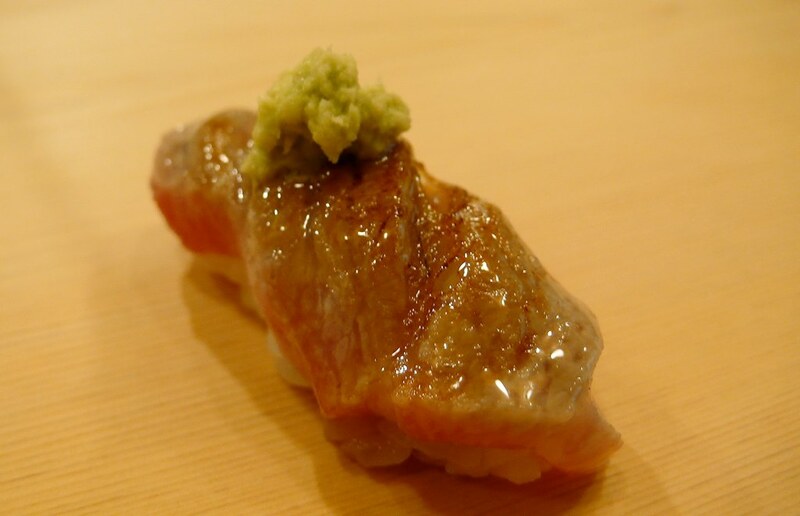 This is called Anagi which means wild eel from the sea. Sawada showed me these beautiful maguro toro pieces after my lunch.